Today on the blog I have a guest post from Health Insurance Comparison about accessing mental health treatment in the private system using medicare and health insurance. I currently access treatment privately and it has been an absolute different experience. Unfortunately the public system just doesn’t have the resources to give everyone long term treatment. They are often more focused on bandaid solutions, which don’t get to the root of the patients struggles. If you’re looking to get support for a mental health condition, you may be wondering how much help you can get from Medicare and whether it is worth buying health insurance. In this post, we look at the support that is available through Medicare for mental health support and how health insurance can help beyond this. Support for mental health conditions through Medicare is mostly limited to the Better Access to Mental Health Care (BAMHC) scheme. This offers Medicare rebates for psychological treatment by registered psychologists. The BAMHC initiative covers a range of mental health conditions including anxiety, bereavement, ADHD, bipolar, depression, eating disorders, OCD, panic attacks, phobias, Post Traumatic Stress Disorder, psychosis, schizophrenia, sleeping disorders and alcohol and substance misuse. To be eligible for Medicare support, you must be referred by your GP or a psychiatrist or paediatrician. Your GP will usually need to complete a detailed mental health assessment and prepare a Mental Health Treatment Plan before a referral can be made. Up to 10 individual sessions can be accessed in a calendar year, with progress being assessed after 6 sessions. Up to 10 group sessions may also be available. The costs depend on a number of factors, including the length of sessions and the fee being charged by the psychologist. If they bulk bill, there should be nothing to pay. If they don’t bulk bill, you’ll have to pay the difference between the Medicare rebate and the fee being charged by the psychologist. If in doubt, check the expected fee with the psychologist to avoid any nasty surprises. Any fee payable above the Medicare rebate will count towards the Medicare Safety Net for out-of-pocket expenses. Psychology is one of the allied health services that is available through the Better Start for Disabilities program. If your child has an eligible disability, they be referred by a GP, specialist or consultant physician to access up to 4 diagnostic/assessment services and up to 20 treatment services including psychology. These services need to be seen as crucial for making a diagnosis or must be part of a treatment or management plan for an eligible disability. Some support is also available through Medicare for seeing a psychiatrist. If you see a psychiatrist as a public patient in a community health centre or public hospital setting, it’s unlikely that you’ll have to pay. As a private patient, a Medicare rebate can be claimed to offset some of the costs. If the psychiatrist bulk bills, a fee won’t be due. Seeing a psychotherapist or counsellor will sometimes be covered by Medicare, as long as they have a Medicare provider number. It’s important to note that health insurance cannot be used to ‘top up’ Medicare support services. You therefore need to decide if you want to use health insurance for accessing mental health services or use your Medicare entitlement. 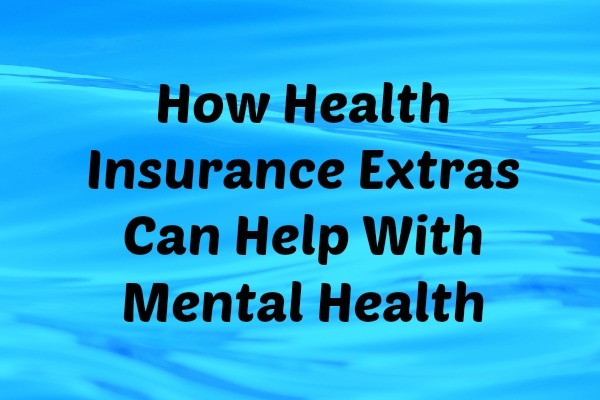 If you aren’t eligible for Medicare support or you prefer to use health insurance to access mental health services, look for Extras cover that includes Psychology benefits. There is typically a 2-month waiting period attached to Psychology benefits, which means that you’ll need to have had your policy for at least this period of time before you can start claiming. Psychology will not always be available on basic Extras policies and you may therefore need to have mid to top level Extras cover to be sure of being covered. Health insurance will sometimes cover the costs of seeing a counsellor or psychotherapist that does not have a Medicare provider number (and therefore will not be covered by Medicare). This will not always be the case though so it’s important to check exactly what is covered on Psychology services before you commit to a particular health fund. It is often the case that you’ll need to use practitioners that are recognised by your health fund to be eligible to make a claim. Take a close look at the annual limits attached to Psychology Extras services. This will often vary between health funds and can amount to several hundred dollars even on top level Extras policies. Bear in mind that if you need to access more mental health services than are covered by your Extras policy, you’ll be hit with out-of-pocket expenses. It’s therefore vital to know exactly how much you are covered for before you start accessing mental health services. Health Insurance Comparison is more than just a comparison site; we want to take the confusion out of buying health insurance. Whether you’re looking for health insurance for the first time or wanting to get more for your money by switching to another health fund, we’ll help you to find a health insurance policy that works for you and help you to get the best value for money. Have you accessed mental health treatment privately? Have you considered health insurance for mental health treatment? This entry was posted in Mental Illness Information and tagged asking the right questions, mental illness, staying well on February 20, 2015 by Tegan.